Certainly, I've been a Sammy fan for a long time. 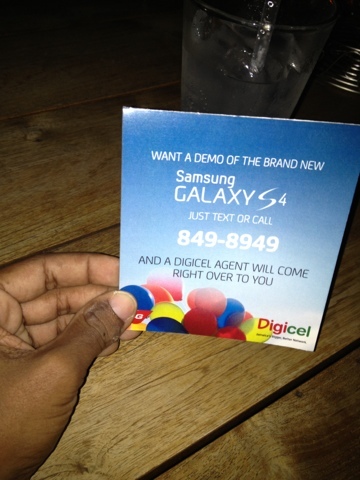 So, I was thrilled that Digicel would invite me to their Samsung GS4 event. It gave me an opportunity to, at least, touch the phone. The handset goes on sale, exclusively I am told, tomorrow. And, from my 'touch' demo I can say, it's a great smart phone. The phone is roughly the same size as the GS3, yet boasts a slightly larger screen. Samsung had to sacrifice the size of the near invisible (or maybe the launch event at CRU was just dark) Menu and Return buttons. I like the rounded square edges and the sturdier feel of the construction. The SG4 doesn't feel like a piece of cheap plastic, but it doesn't feel quite as sturdy as the iPhone. As expected, the screen looks great and is ridiculously responsive. Navigation was effortless. With the low light and the high background noise, I was unable to try out features like the air gestures or S Voice. As for the air gestures, I heard from a couple attendees (in Digicel branded shirts) that they work like a charm. The same folks told me that the previous non-functioning (practically speaking) S Voice was much improved. The Dual Shot feature on the camera was cool, but, I wonder, would we get bored of it by next week. Hmm. The camera has a lot of new and upgraded features to explore. I like the slightly enhanced icons, the S Health looks cool, the screen mirror looks useful, the IR remote I hope works and the upgraded All Share looks like fun. The Samsung Hub left me feeling like it was completely unnecessary. So too did the typing, just like the SG3. I don't find the keyboard easy to use or insightful. But, the feature that has me thinking 'I like this phone' is the Safety Assistance ... a feature I hope I never need but glad I have. Beyond that, this new Sammy has so many features crammed into one mobile device, that its hard to want anything else. I'm told the bigger battery and the improved OS make it run faster for longer on one charge. I will try to confirm that if I ever get a road test model. If money was no object, I would buy this computer masquerading as a phone in half a heart beat. If you have the S2, time to ditch and move up. If you've got an S3 and you're tapping it out, time to upgrade. If you're a poser that is rich and likes to have the latest, time to upgrade. If you're a student, fixed income professional, unemployed loafer, tech newb or person who actually uses a phone primarily for making calls (amazing), you may want to wait for my final review after the price check.